Your Springfield XDS 45 is small and compact, and it’s one of the best choices for a conceal carry weapon. When you’re looking for a XDS 45 holster, you want to look for something that will stay molded to the firearm and won’t create too much additional weight or too much bulk under your shirt. Whether you choose an inside of waistband (IWB) holster, an outside of waistband (OWB) holster, or even ankle and shoulder holsters, your XDS holster shouldn’t be uncomfortable to wear throughout the day, and you should be able to quickly draw and smoothly holster your weapon. We’ve compiled a list of what we think are the best holsters for XDS 45 handguns, and we’ll let you know at the end of our reviews which holster we think is the best XDS holster for the everyday conceal carry gun owner. Materials – The Sticky Holsters for XDS 45 handguns is made of a special sticky material that utilizes body friction for its retention. It suits well as an inside of waistband holster or a pocket holster. It’s all black for best concealment, and it can be used by either left handed or right handed shooters. It is not specifically designed for Springfield XDS 45s, but it is instead made to fit all small firearms in the same category. It has Level I retention, and it covers the trigger guard and small lasers. 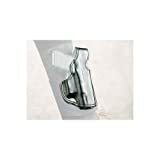 Sticky Holsters offers a variety of different sized holsters to fit your specific needs. Performance – As far as Level I retention goes, this is the best concealed carry holster for XDS 45 handguns for this price range. Whether or not you appreciate the sticky adhering material will be up to your personal preference, but we think it has great use, especially for wearing in our pockets. We also appreciate its ambidexterity, which makes shopping for this holster a little easier. We do wish the Sticky Holsters for XDS 45 was actually fitted for the gun itself, but we also appreciate that we can use this holster for multiple pistols, if we needed to. What we say – For a little under $30, this is a great holster to purchases, especially if you’re not sure if you prefer and IWB holster or a pocket holster. If you also like to change up your conceal carry weapon, you’ll be satisfied in knowing you only need to purchase the one holster. At the same time, some pistols may not all fit the same, since it is not molded to the shape of the gun. The Sticky Holster Springfield XDS 45 holster is great for anyone who wants a little more versatility with their conceal carry. What's a Sticky Holster? : We have developed special holsters into a modular system, where you can use it IWB, in the pocket, on your ankle, etc. The outside skin is a super non-slip material that, with a little pressure, adheres to just about anything. That outer material combined with the inner closed-cell foam and the inner liner keeps your pistol and the holster securely in place. 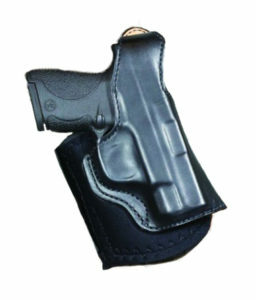 MD-2 Medium: This Holster is designed to fit small 9MM's With Laser & Wider Guns Up to a 3.3" Barrel. Perfect for Waistbands or Pockets: Sticky Holsters are perfect to be carried in the waistband or pocket. They can be used in sweatpants, yoga pants, jeans, and everything without a belt. As long as your pants stay on the holster will keep your pulse in place for easy access if needed. This holster will also work in your pocket as well. Materials – The DeSantis Die Hard Ankle Springfield XDS 45 Holster comes in all black, and it is made from top grain saddle leather with a polyurethane coating finish. It’s designed to last a very long time through rough conditions, as it was originally introduced for federal law enforcement. The smooth finish is meant to protect your firearm from any scratches or dings, and it can provide a “quick, silk draw.” The neoprene leg band on the ankle holster is padded with foam and line with sheepskin for ultimate comfort. There’s a conventional thumb break for Level II retention. Performance – For an ankle XDS 45 holster, the DeSantis Die Hard Concealed Carry Holster is really top of the line. The leather is very high quality, and does what it claims to do by providing a smooth draw. If it’s good enough for federal law enforcement, then it’s good enough for us. Our one complaint is that this ankle holster feels a little boxy, and it may weigh down on the leg strap for some, depending on the wearer’s stature. However, the leg strap itself is quite comfortable, and allows for plenty of adjustment in size. What we say – If wearing your conceal carry on your waist just isn’t for you, the DeSantis Die Hard holster is easily the best ankle XDS holster to purchase. It costs a little under $60, which isn’t too crazy of a price for a holster, especially one that’s made with a high quality leather material. The hard finish can make the wearer feel confident when performing everyday activities with their conceal carry on their ankle. Materials – The Barsony Nylon Shoulder Holster for Springfield XDS 45 is all black and is made of cordura and nylon materials on Oregon, U.S.A. It only weighs about 10 ounces, and it can adjust for up to 60” in chest size. This shoulder holster for Springfield XDS 45 handguns has a four way adjustment system, so you will be confident that you can wear your conceal carry all day with comfort and ease. It also has two belt loop ties, so it can secure to the waistline. There are two flat shoulder pads that are made of suede leather, which grabs onto the wearer’s clothing for security. Additionally, there are double magazine pouches, and the holster can be worn for both left handed and right handed shooters. Performance – Wow! If you’re ever worried about your firearm sliding around or rattling, you should absolutely consider this Springfield XDS holster. 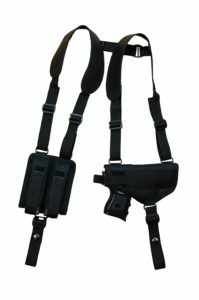 As a shoulder holster, this is great for concealing our handgun while sitting at a desk or even walking around all day. Despite how versatile the adjustments are, we will say it is sort of tricky to get this shoulder holster to fit just right. It will take a little time to get the straps exactly where you want them to, but it will be worth it once you do. What we say – We really think the Barsony Nylon Concealment Shoulder Springfield XDS Holster is one of the best on the market for anyone who doesn’t like a metal clip digging into their side. If you think you’ll frequently be drawing your firearm, you may not want this type of holster, but it’s a great choice for anyone who thinks they need to wear their conceal carry the majority of the day. If you’re sitting all day in a car or at a desk, this will be really ideal for you. It costs just over $50 online, which is pretty good for a XDS 45 holster that comes with so many features. Materials – The Outbags LOB2S-XDS33 Springfield XDS Holster is an inside of waistband holster made of all black leather. 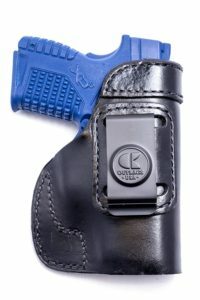 The leather has a hard clear coating for protecting both the material and the firearm within the holster. The holster is molded to the shape of the wearer’s conceal carry, and it comes with a strong metal clip for the waistband. The Outbags XDS 45 Holster does cover the trigger guard, but the back end of the gun is left fully exposed. 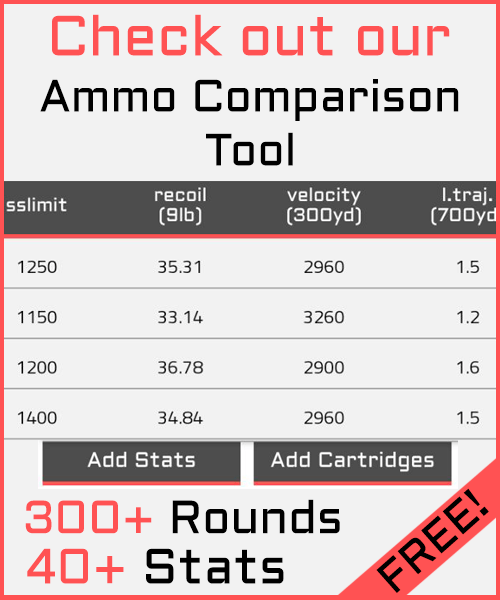 This can be ideal for when a quickdraw is needed. Performance – If you do actually prefer a standard inside of waistband conceal carry holster, the Outbags LOB2S-XDS33 model is a basic product that gets the job done for a low cost. Unfortunately, we think IWB holsters made of leather aren’t the most comfortable, but that can vary depending on the wearer. This is really a no frills holster for anyone who doesn’t require extra retention of concealment. What we say – The Outbags XDS Holster costs just under $30, and it’s perfect for anyone who is very familiar with their conceal carry and knows they don’t need anything extra. It’s also good for anyone new conceal carry owner who isn’t quite sure what their holster preferences are yet. 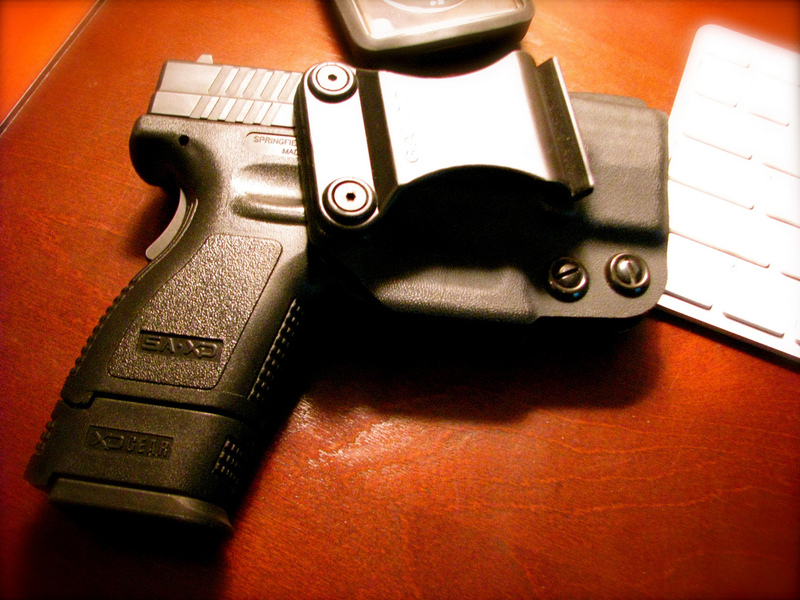 Therefore, it suits well as an IWB holster for both beginners and the seasoned gun owner. Since we covered four different types of holsters for your Springfield XDS 45, it’s a little difficult to say which is exactly the best for most gun owners. However, we think the DeSantis Die Hard Ankle Concealed Carry Holster is our favorite in this review. It’s made of a really nice leather, it’s not too expensive, and an ankle holster is fairly common amongst conceal carry gun owners. We think this is a great choice for anyone who isn’t a big fan of IWB or OWB holsters, but they also need to be able to quickly access their firearm when the time comes.